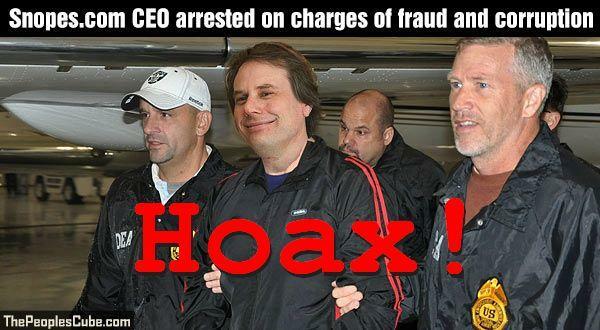 While researching some unrelated hoax story we found there was an old story out there about the arrest for fraud and corruption of Snopes.com owners Barbara and David Mikkelson, considered by many (including us) to be the patron saints of online fact checking. The story alleges there was an altercation at a flea market in Los Angeles involving a 'Brian Williston', accountant and part time writer for famous fact checking site Snopes.com. Subsequent investigation supposedly lead to the discovery of a ledger revealing the site had been taking bribes to debunk or confirm stories that would cast certain political figures in a good or bad light. Secondly, the supposed 'arrest photo' that goes with the article is a photoshop with the head of David Mikkelson pasted over the head of Victor Bout, a notorious illegal arms dealer whose life story was later made into a movie named "Lord of War". Funnily enough, the hoax hasn't been debunked yet on Snopes.com. Glad to help out, David and Barbara!